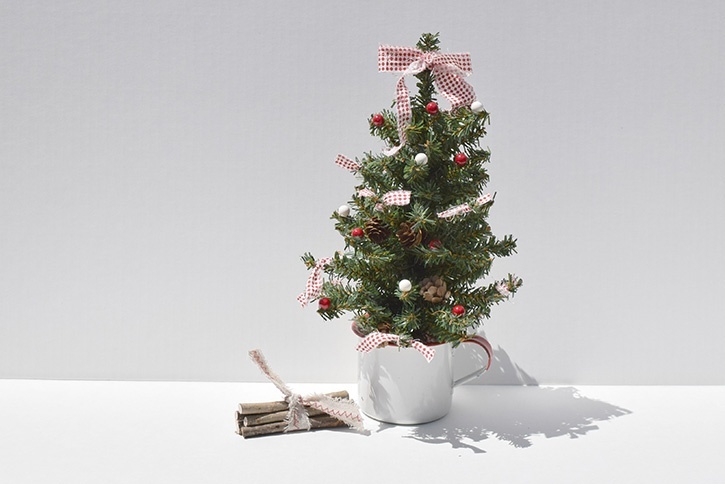 This holiday season, get your kids involved with Christmas cards with this simple printmaking project. Each card will have its unique look and you will have the start of a yearly holiday tradition. Here is a fun way to dress up a simple back of microwave popcorn. Have them on hand to give as a gift when unexpected guests arrive at your door this winter season. They also make a great gift for bus drivers, teachers, lunch aids, and coworkers! Using Glue Lines, wrap the 5.5 x 8.5 inch white card stock around the package of microwave popcorn. Press to secure the adhesive. 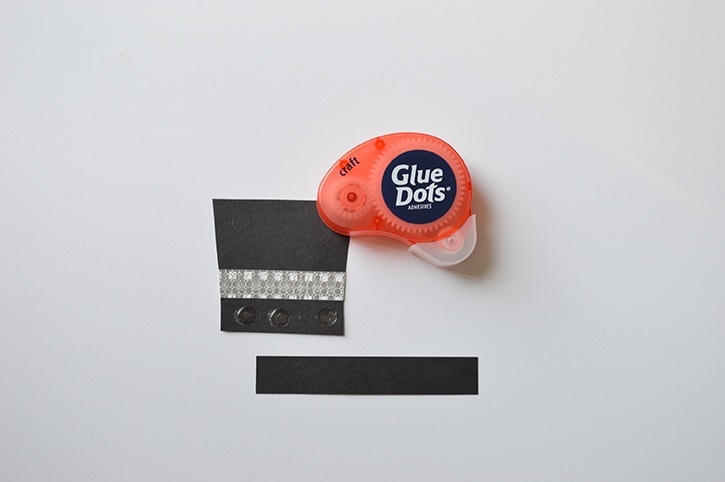 To make a hat, cut a strip of DCWV card stock that measures 4.5 x ¾ inch. 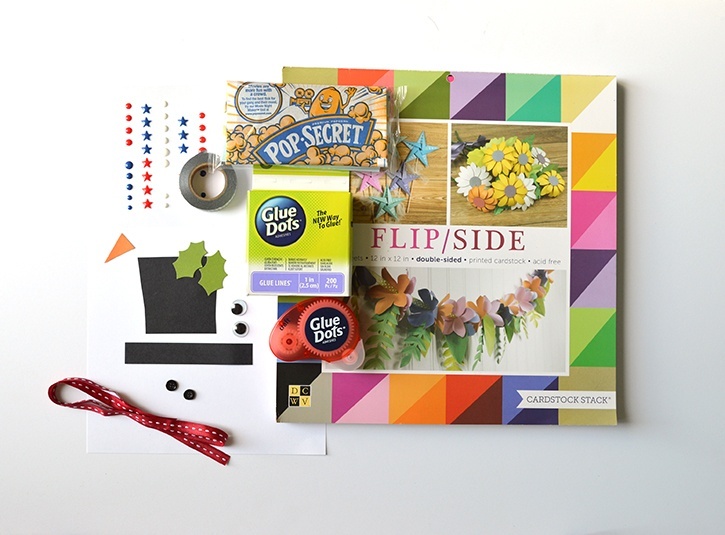 A piece of card stock that measures 2.75 x 3 inches can be trimmed into a hat shape. Use decorative washi tape to add silver glitter washi band across the hat. 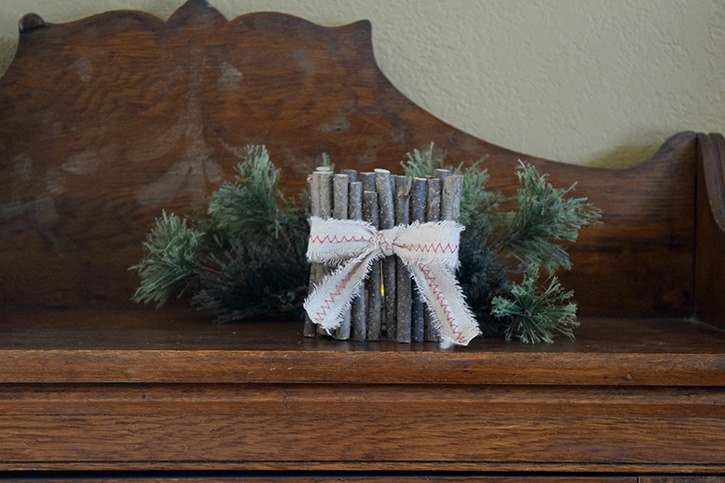 Use the Sizzix BigShot and holly die to cut out holly leaves from green DCWV card stock. 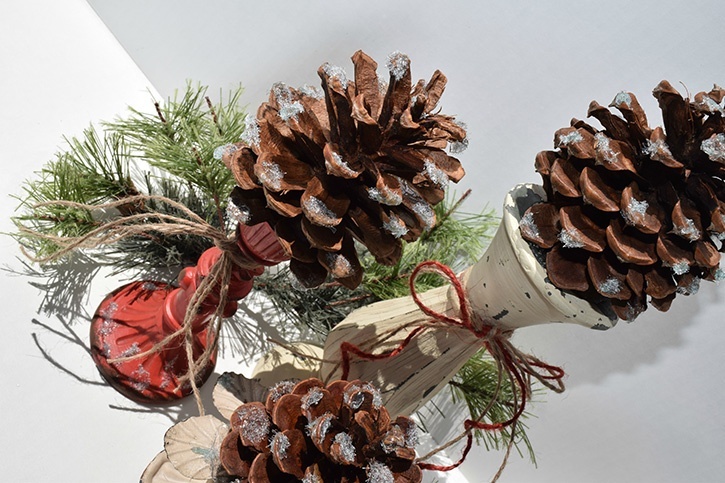 Use Craft Dots to adhere the holly leaves and red enamel dots to the hat. Glue to the top of the popcorn sleeve. Use a dauber to create pink cheeks using pink dye ink. A black Sharpie marker is used to create coal mouth. Add the googly eyes and orange triangle nose, cut from DCWV FlipSide stack, to build your snowman face. Wrap the red ribbon around the popcorn, just below the center part. 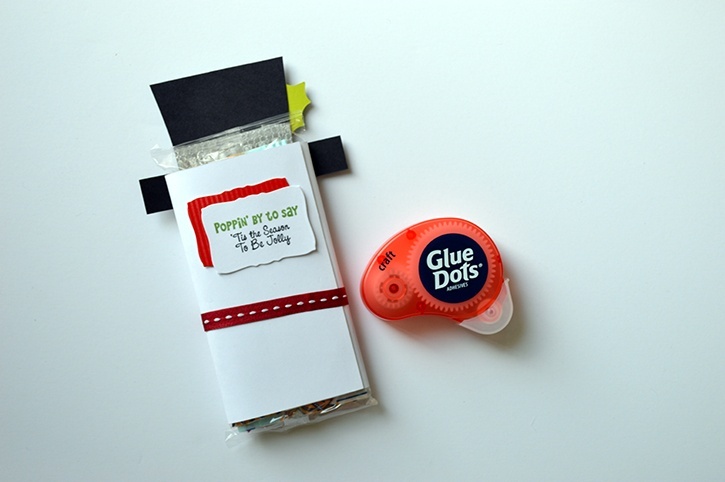 Tie a knot and secure it and the ribbon ends with Craft Dots. Then add the black buttons. Tip: Keep your button box full when you clip and save buttons from clothes you are discarding. Flip the popcorn sleeve over. 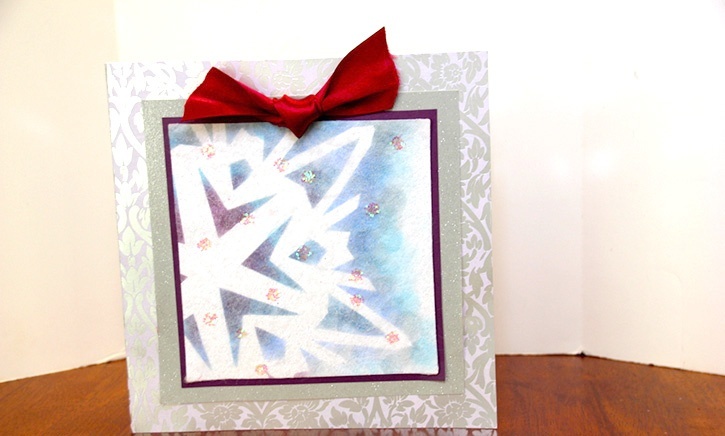 Create a tag using card stock scraps and Spellbinders Nestabilities shapes. Use colored dye inks for a more eye catching look. 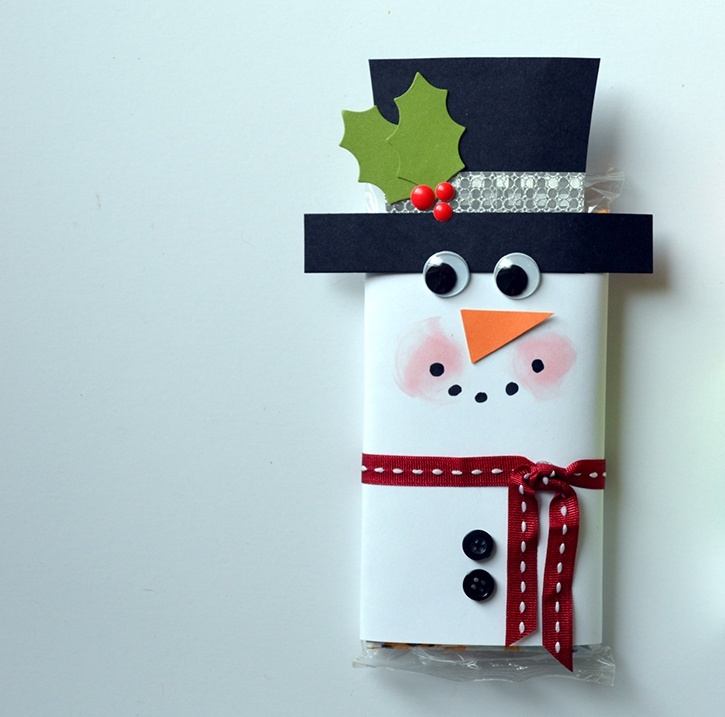 Adhere to the back of your snowman popcorn sleeve. There is room on the bottom of the back of the sleeve for you to write a personal note or sign your name. 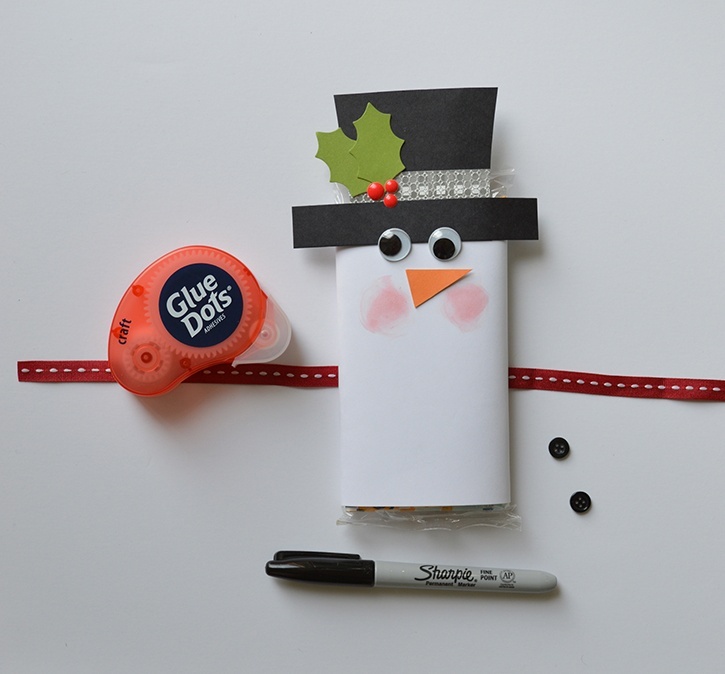 A simple treat can bring a smile to anyone’s face when you dress it up using Glue Dots and some wintry holiday style!